AUTO STAC Japan / Nippon Keidenki Works Ltd. 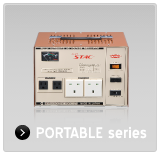 The PORTABLE series is the most familiar lineup of automatic voltage regulators. 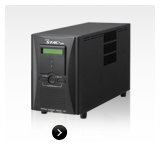 The capacity of 500VA,1000VA and 1500VA are available. Small sized and light weighted,they are always by your side for your power sentry. Variety of output sockets and input plugs are prepared for your selection. 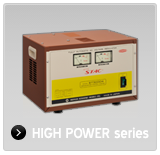 The HIGH POWER series boasts bigger capacity of power. Coming with 2000VA and 3000VA, they can afford to act with variety of purposes. As a mid-sized STAC, they keep your equipment from unstable power. 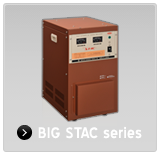 The BIG STAC series, the stationary type, is the biggest series for single phase voltage regulators. Comprised with 5000VA and 10kVA models, it is a series of powerful enough not only for household use, but also for factories, shops and offices. This is the professional type of regulators. 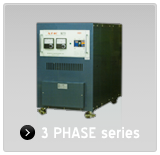 The 3 Phase regulators are repuired in most of the industrial scenes. Are you ready for electric failure? It happens suddenly and may lose your important data from the PC. Copyright(C) NIPPON KEIDENKI WORKS LTD. All Rights Reserved.